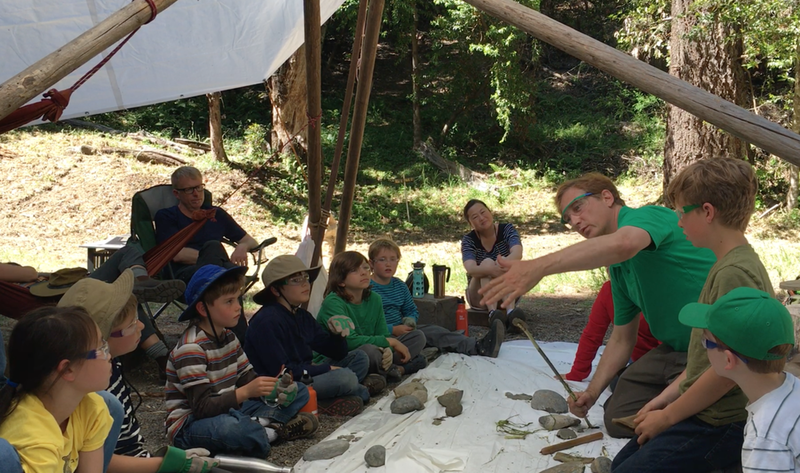 Stone Tool Scientist Ben Walker teaching arrowsmithing and flintknapping. Rain or Shine, your kids outdoors! See the below videos from classes last year. Join us one or more days each week for a class at Tribal Wisdom Academy! (If a parent paid for an above date and your child was absent for any reason, your student may attend the Make-up Class on May 20th, 2020). Wednesdays 1:30pm to 4:30pm: This afternoon class includes many local school kids, age 8 to 12, out in the woods doing our cool classes. The class is taught by Professional Tribal Wisdom Academy Mentors and includes fun small group projects. Your children will get to experience opportunities to grow in emotional intelligence by being allowed to work through their experiences with each other, rather than be lectured on what is right and wrong. Students get to make new and deeper friendships, and discover who they are. Each class gives your child actual human childhood, in the woods where it all began. Kids in our local mountain community who get out of school early on Wednesdays may arrive late if needed. (Parents usually pick up their kids from school at the beginning of their school's lunch period). Please pack a hardy snack for your child (or a serious hotdog meal) for the 4pm-4:30pm closing campfire. The Wednesday 10am-1pm morning classes are for any homeschooler age 5 to 14. (A parent is required for each student age 7 or younger, until the student demonstrates enough grit to be outdoors with the gang). Anyone can join the class, but if your homeschoolers are registered at Ocean Grove Charter School, you can also ask your Education Specialist for a Purchase Order during the Spring 2020 Semester: Tribal Wisdom Academy is Vendor # 15848, Teacher Ben Walker, 9 class sessions in Applied Sciences, $810 total (or $90 per class day) and please date the P.O. March 18 to May 22, 2019. (Note that Ocean Grove policy states that during the class, O.G. students cannot shoot the bows that they make, carve with knives, nor attain fire during the class). Please pack a lunch for the 12:30pm campfire and be prepared for an adventure outdoors! Groups of 10 to 30 homeschoolers may instead book Tuesday classes. Sign up now to get all 9 Tuesday classes, which begin on March 12 through May 2019. Private groups may include ages 5 through teenagers, (with a parent required to initially attend with each child age 5 to 7). The Tuesday program does not qualify for Ocean Grove funding, and OG families may choose Tuesdays or Wednesdays 1:30-4:30pm by paying-out-of-pocket. This will provide a fully authentic human childhood with real tools and real fire. See the PayPal Buttons above, or contact Ben to RSVP your placement while you talk to your education specialist. Please share Tribal Wisdom Academy on Facebook! Teacher, Founder, Director Ben Jamin Walker has been teaching kids outdoors for 40 years. From decades in the Boy Scouts to travels with tribes in over 30 countries, Ben shares a wealth of skills and experience with the Tribal Wisdom Academy students at the TWA summer camps in 2019.